Greg O'Shields fights through contact as Jack Lowe supports. Throughout the match the Tigers worked for sustained possession and ball control trying to limit the Catholic attack. However the Cougars were able to capitalize with their possessions and move out to a 19-0 lead mid way into the first half. The Tigers used a well-structured maul to ultimately yield their first try on the evening. Catholic responded with a try of their own and took a 26-5 halftime lead. 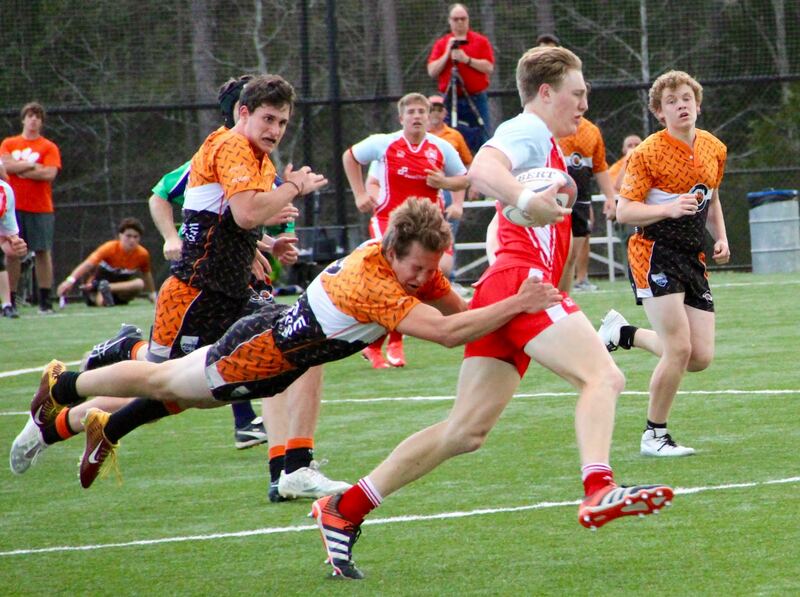 The second half yielded more of the same results with Catholic putting across three more tries and Tigers touch down after a series of Cougar penalties. The final score for the day was 45-12 in favor of Charlotte Catholic. Next up for Catholic is a show down with Union County Lions to establish first place in the NC Open and MSIRL leagues.